Simplifies each stage of website creation, from planning to loading and managing your site. For anyone who wants to produce high quality websites, across different platforms including for tablets and smartphones. 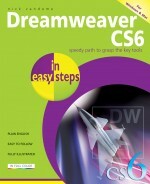 Dreamweaver remains the most powerful and versatile web authoring tool on the market. The Creative Suite 6 release offers even more functionality to create dynamic, state-of-the-art websites for more platforms. Dreamweaver CS6 in easy steps shows you how to work with the different workspace views so that you can work in either design or code view. The book also looks at how to optimize a website for mobile devices using Fluid Grid Layout and the new Multiscreen Preview. CSS is integral to modern websites and this is covered in detail: from the basics of CSS, to creating and applying styles so that you can produce standards-based websites that have a consistent look and feel across all pages. Also, the new CSS3 Transitions panel shows you how to create original and engaging animated features with CSS. 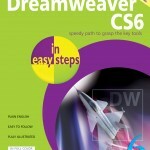 Dreamweaver CS6 in easy steps simplifies each stage of website creation, from planning to loading and managing your site, helping you to unleash your creative potential effectively and is aimed at anyone who wants to produce high quality websites, across different platforms including for tablets and smart phones. Learn Dreamweaver basics for free!